Who Knew Scaffolding Design Could Be So Rigging Awesome? The Air Force Academy's dramatic new Center for Character and Leadership Development in Colorado Springs presented unique challenges. Courtesy BrandSafway. Some people notice scaffolding only if it’s getting in the way of a perfect, Instagrammable shot—but others view it as beautiful in its own right. Highly trafficked structures like the Colosseum, Parthenon, Taj Mahal, Travelers Tower, US Capitol Dome, and Washington Monument have all required extensive restoration in recent years, which means someone created scaffolding to fit each of those iconic shapes. New buildings that push architectural boundaries, such as the Air Force Academy in Colorado Springs and 432 Park Avenue in New York City, also demand advanced scaffold engineering. Scaffolding design is clearly not a one-size-fits-all endeavor. 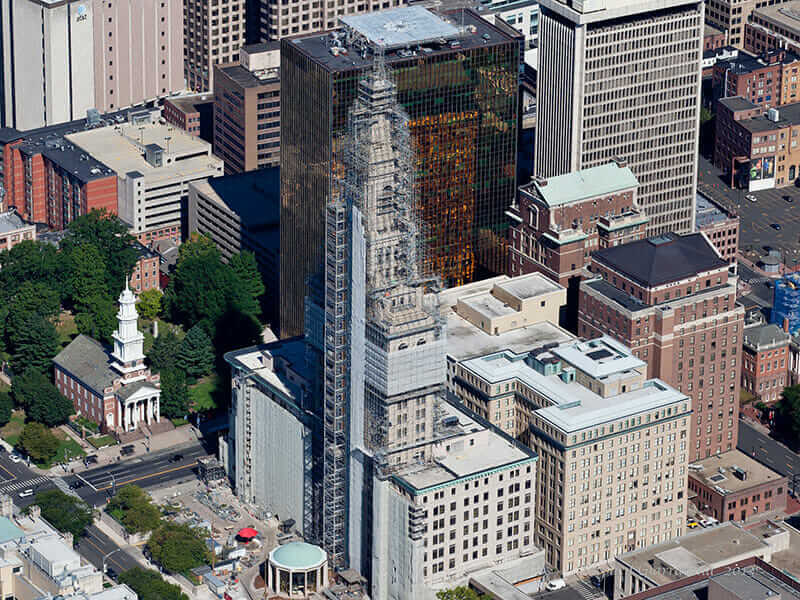 The Travelers Tower in Hartford, Connecticut. Courtesy BrandSafway. On a more quotidian level, scaffolds show up everywhere, erected for new construction, renovations, or even just a fresh coat of paint. So even though scaffolds might all seem the same, they’re not. Every scaffold must be designed, and some scaffolds are actually multiple scaffolding systems put together like a puzzle. But what’s most surprising, and serious, is just how much can go wrong, from construction delays to serious collapses endangering workers and the public. One technology that is driving change in the industry is reality capture, which creates 3D models from photographs or laser scans for more accurate and precise modeling. One company, Brand Industrial Services, known as BrandSafway, is using the technology to great effect. BrandSafway follows a scoping process to figure out the best approach for each project, which can involve an experienced supervisor working with a client, or a field activity where clients fill out a form or checklist themselves, documenting what they see. 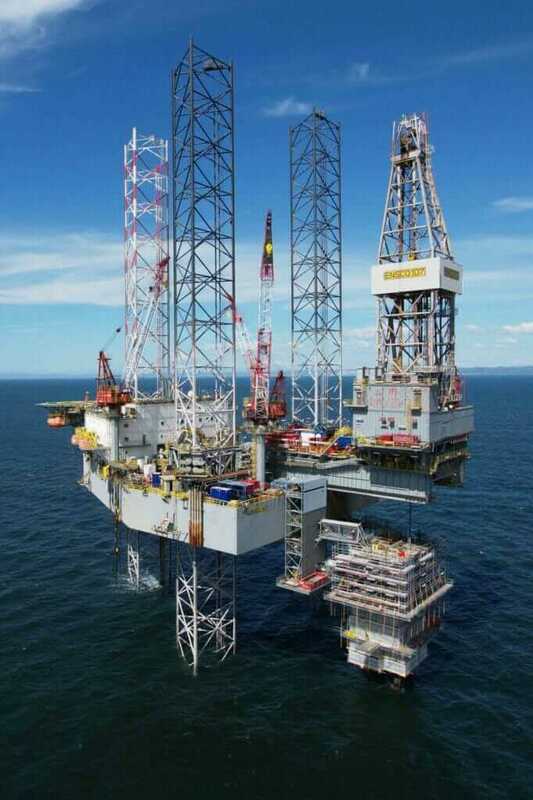 A scaffolding and access solution designed for refurbishment at the Shell-operated Pohokura field, located offshore near the North Island of New Zealand. Courtesy BrandSafway. The finished visual field work package includes an estimate of labor, scaffold materials required, a CAD-powered DWG file, and a 3D model for a recap. “If we don’t do the visual work package process, a lot of times we spend time, money, and resources to fix the scaffold or tear it down and build the right one. And so by using the visualization, we’re able to take waste and inefficiency out of the process,” Dunlap says. Because every building has a unique design, scaffolding businesses must consider the size of the scaffold needed, whether it will fit, the amount of use the scaffold will need to endure to complete the project, and other special conditions (such as fire hazard areas requiring all-metal components instead of wooden scaffold planks). Reality capture narrows the scaffolding design process, and even factors in the materials that will be required. The technology saves BrandSafway clients as much as 35 percent compared to “old-school or traditional ways” of verbal communication of scope and building scaffolds, according to Dunlap. He adds that some projects may involve as high as 50 percent scaffold modifications, which indicates a lack of a clear understanding of a client’s needs. This variance can count for as much as 50 percent of the total man hours on a project spent fixing scaffolds because of poor communication. 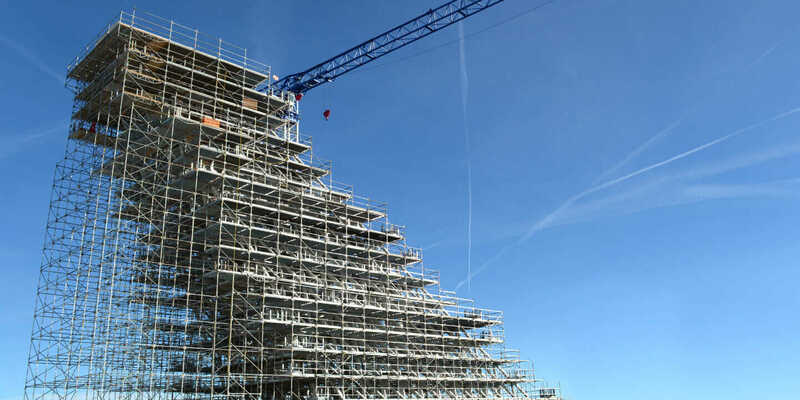 There are hundreds of pre-engineered scaffold construction systems, but just a few dominant systems that are well-known in the industry, including: cup-type, pin-type, Safway Systems Scaffold, and tube and clamp. Pre-engineered scaffold systems can be arranged in a variety of potential combinations that have been tested and verified for strength and safety. Dunlap says BrandSafway owns about $2.6 billion worth of scaffold and access equipment. Scaffolds used in refineries can be used by as many as eight different contractors, including inspection, piping, equipment, electrical, and specialty service personnel. Courtesy BrandSafway. BrandSafway is often tapped by the likes of Shell, Valero, and Halliburton in the oil and gas industry to build scaffolding meant to hold up over longer spans of time. The oil and gas industry is unique because hundreds—sometimes thousands—of personnel are involved in frequent routine maintenance activity, whereas other industries don’t necessarily perform routine maintenance. A single scaffold could be used by eight different contractors, including inspection, piping, equipment, electrical, and specialty service personnel. 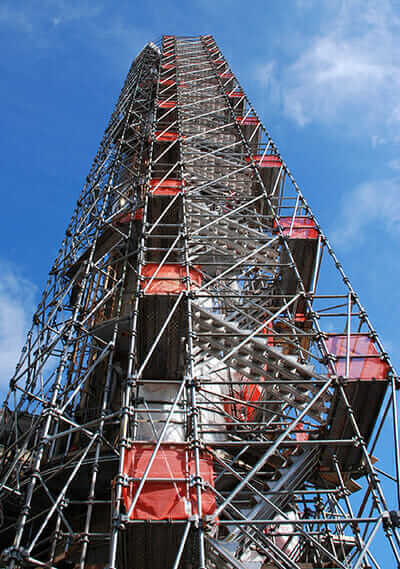 This amount of maintenance required for the industry’s safety standards gets expensive, which means it is in the company’s best interest to get scaffolding design right the first time around. “When you look at a client’s spend for scaffold service, a large element of that spend can be identified as opportunity to reduce waste, or to improve fit for use for that scaffold,” Dunlap says. Getting better, for BrandSafway, means exploring and making full use of available technologies. Once tech such as reality capture becomes commonplace, the company says it will consider even more advanced simulation technologies such as augmented reality and virtual reality. So even though it’s easy to take scaffolding for granted, despite its vital importance to any infrastructure, the scaffolding design process will continue to evolve, increasing safety and efficiency along the way.